Simple, filling and nutrient-rich breakfast. 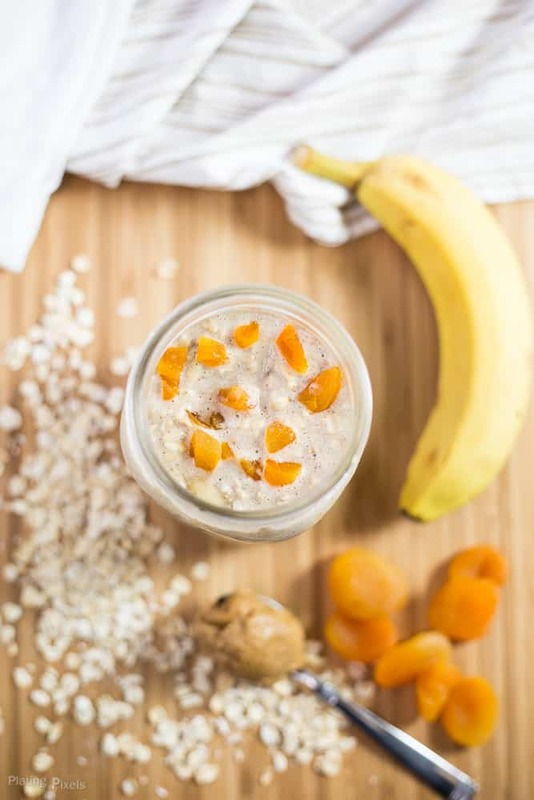 Apricot Almond Butter Overnight Oats that’s vegan and gluten-free. 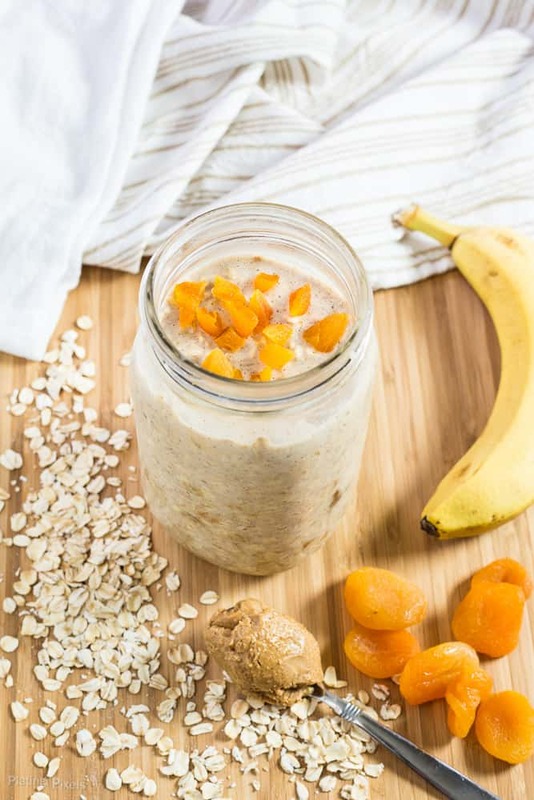 Banana, almond milk, oats, almond butter and dried apricot is all you need for this breakfast treat. Within this recipe post you’ll make an easy breakfast that tastes like dessert, but you can feel good about. Plus you’ll learn the ideal ratio of oats to liquid, so you can make your own endless overnight oats combinations! I’ve finally given in to trying overnight oats, and may have found my new favorite breakfast food. Have you tried them? It’s seriously as amazing as you’ve heard. What’s better than adding a few ingredients to a jar or bowl, letting it sit overnight, and waking up to a delicious ready to go breakfast. Plus there’s endless mix-and-match possibilities; add as many or as little ingredients as you’d like for a variety of flavor options. The first overnights oats recipe ever I’m sharing here on the blog is this Apricot Almond Butter Overnight Oats. Overnight oats can be made in large batches and are ready to go in the morning, saving you time. It’s can be as nutrient rich as you want, based the ingredients as you add to it, with plenty of protein and fiber. General ingredients you can add are milk (including regular, almond or soy milk), fresh or dried fruits, seasonings, nuts and seeds. 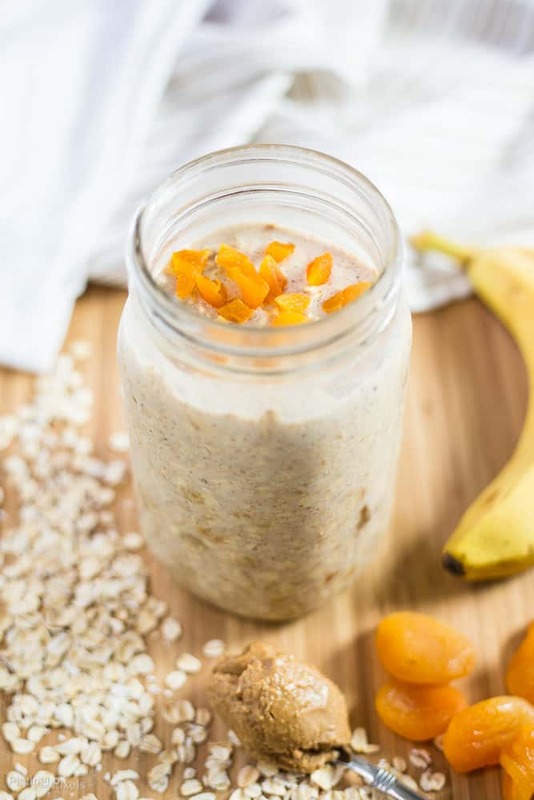 For this vegan Apricot Almond Butter Overnight Oats I’ve used only 5 ingredients. 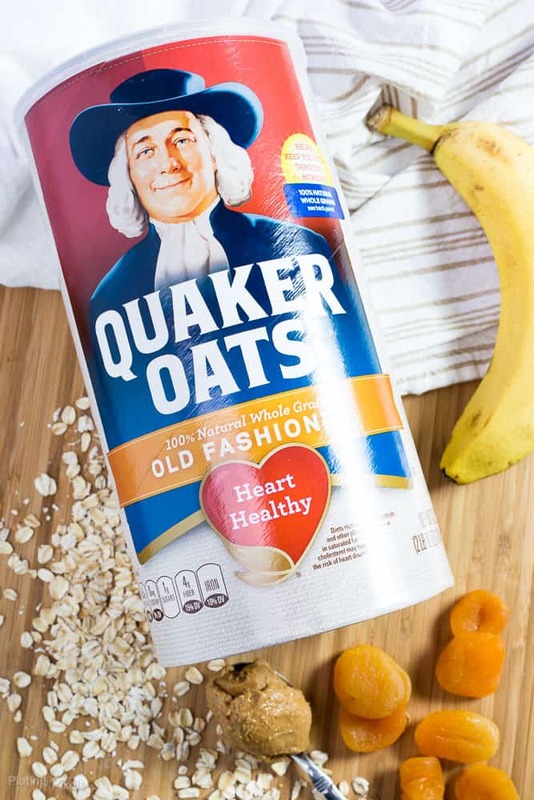 They’re some of my favorite flavors and meld together into a filling breakfast that literally tastes like dessert, but is oh so good for you. Start with vanilla almond milk and stir in almond butter until combined, then add overnight oats, dried apricots and fresh (ripe) bananas. It has perfect texture that blends with chewy bits of apricots. The almond milk is slightly sweet and ripe bananas top off this sweet breakfast treat. You want a 1:1 ratio of oats to liquid. So if you have 1 cup of oats, add 1 cup of almond milk for example. You can add any mix-ins and it won’t change the ratio much. For this recipe I used slightly less oats since I like mine with a bit of liquid leftover, plus the dried apricots soak up some liquid. Experiment and find your favorite ratio. Simple almond butter overnight oats for breakfast that's vegan and gluten free. Place almond milk and almond butter in a large mason jar. Seal and shake well to combine. If using a bowl or container mix well with a whisk. Add in remaining ingredients and stir to combine and evenly coat oats. Seal and refrigerate overnight to soften oats. Wake up and enjoy your ready-to-go breakfast. Serve cold or heat if desired (I prefer it cold). I have a bunch of fresh apricots. Do you think it would turn out okay if I chop those up and use them? Hi Maria, you totally could. However dried apricots are much sweeter so the flavor will be different. Maybe add extra honey? I love overnight oats – your combo of apricots and almond butter sounds the best! Pinning for later. Yum! I absolutely love overnight oats. This is a really creative + delicious combination. Will need to give it a try soon!! It’s surprisingly simple but so tasty! Thanks Brianne and I hope you do! That’s perfect Carolyn! It’s always good to have those oats on hand. Thanks! These oats sound delicious! Your pictures are gorgeous. I love overnight oats! I haven’t had dried apricots for a long time. Thanks for reminding me of this forgotten dried fruit! Me too Willow! I too have neglected them for a while, but they’re great for cooking. Thanks! Really pretty and I love overnight oats. So convenient! I love overnight oats! They’re so fun for breakfast. Love that these use dried apricots, one of my favorites. Beautiful photos! Me too! I’ve never used dried apricots like this but it worked great. Thanks so much Emily! Overnight oats have to be one of my favorite treats. They are so delicious and keep me full so long. Thanks for this new great recipe! They’re becoming my favorite too! And so true on them being filling. You’re welcome Kristen! I love doing overnight oats, and this is such a good recipe using one of my new faves – almond butter! I’ll be giving it a go tonight, I don’t know why I didnt think about it before! It adds great flavor and just a little bit goes a long way! Thanks Lottie and enjoy! I’ve been enjoying overnight oats for a while, but have never added apricot to it. This is a must try! I love overnight oats! I haven’t tried adding apricot, will have to give it a go. What a healthy, delicious recipe – thanks for sharing! I LOVE overnight oats and I always forget about apricots, so this is great! YES! I love overnight oats.